When one discusses the history of Boxing, there are many legendary figures of the sport. Fighters who were able to establish themselves as legends for various reasons. In regard to Boxing’s Middleweight division, one would be hard pressed when discussing its history to not mention the name of Bernard Hopkins. Hopkins, the fighter who made a career out of doing things his way by refusing to play ball with numerous promoters and such that could have elevated him to superstar status in the sport at a much earlier time in his career. The fighter known as “The Executioner” for much of his career would instead systematically construct one of the greatest reigns as a World Middleweight champion in history. A reign atop the Middleweight division that lasted for over a decade from 1995-2005 and compiled twenty successful defenses, a Middleweight record, of what became the Undisputed World Middleweight championship. For much of that reign, Hopkins was largely under the radar and did not receive the kind of exposure and recognition due a fighter that was in his position. It wasn’t until Hopkins began the process of unifying the Middleweight division in 2001 that he began to receive the exposure and overdue recognition that he deserved when at age thirty-six he successfully unified three world championships in a unification tournament that involved fellow Middleweight champions Keith Holmes and William Joppy. The clear intended centerpiece of the tournament however, was the heavily favored multi-division world champion Felix Trinidad, who was moving up in weight and sought to not only capture his third world title in as many weight classes, but also to cement his legacy by walking away from the tournament as the unified Middleweight world champion. Trinidad was able to accomplish the first part of his goal by scoring a knockout win over WBA world champion William Joppy in May 2001. This set up the showdown in the finals of the tournament in September of that year against Hopkins, who successfully unified his IBF world championship with the WBC world championship by scoring a twelve round unanimous decision over Keith Holmes in April of that year. The showdown between Hopkins and Trinidad was in many ways Bernard Hopkins’ finest hour. As an underdog, Hopkins not only scored the victory over Trinidad, but was able to dominate a fighter regarded as one of the most dangerous and devastating knockout artists in the sport. The brilliant tactician Hopkins capped off what was to that point the best performance of his career by scoring a stoppage victory over the previously unbeaten Trinidad in the twelfth and final round. After many years of fighting what some may call the establishment of the sport and defending his world championship with little fanfare, Hopkins finally had his long-sought after recognition. As brilliant as Hopkins’ victory over Trinidad was, Hopkins ability to dominate heavily favored opposition would become his trademark as he would go on to score victories against all opposition including finishing the unification process in September 2004 by knocking out then WBO world champion Oscar De La Hoya in nine rounds. After losing the Undisputed Middleweight crown in 2005 by losing a disputed decision to Jermain Taylor and failing to regain the championship later that year in a rematch, Hopkins moved up in weight and once more as an underdog scored a dominant twelve round unanimous decision over multi-time Light-Heavyweight world champion Antonio Tarver in June 2006 to win the IBO Light-Heavyweight world championship before a brief retirement from the sport until his first comeback in July 2007 with a twelve round unanimous decision win over Ronald “Winky” Wright. Although Hopkins would go on to lose fights to Joe Calzaghe and Chad Dawson, there was always some debate as to whether or not Hopkins lost those fights much as there was debate following his two losses to Jermain Taylor among Boxing fans and experts alike. This observer had said on numerous occasions whenever I had the pleasure of discussing the sport and the subject of Bernard Hopkins with readers and others that those fighters who were able to get a victory over Bernard Hopkins including Hopkins’ 1993 loss to Roy Jones in the first of their two encounters, were able to get the win, but did not necessarily win those fights impressively due in large part to Hopkins’ crafty Boxing style. Even as Hopkins would go on to become the oldest fighter in the history of the sport to win a world championship in 2011, I could not say with certainty that I had ever watched a Bernard Hopkins fight that he ended up on the losing end of, that I personally felt that he not only lost the fight, but lost by a convincing margin. There was always some argument that could be made for Hopkins having won those fights. It was not until Hopkins last fight in November 2014, a Light-Heavyweight unification battle against the undefeated knockout artist Sergey Kovalev that I felt Hopkins bit off more than he could chew. For twelve rounds, the WBO champion Kovalev dominated Boxing’s elder statesman Hopkins, who entered as the unified IBF/WBA world champion to win a convincing unanimous decision. The thing that was somewhat ironic about Kovalev’s victory over Hopkins was that the fight was fought at a tactical and measured pace, a pace that was perfectly suited for Hopkins’ style and despite that, Hopkins, who was forty-nine years old at the time of the bout could not find a way to combat and defeat a younger and stronger opponent as he had been able to do so many times before throughout his career. Some readers may remember this observer’s coverage of that fight in saying in a post-fight column here on the website titled “Has Hopkins Reached The End Of The Road?” that although it would not have shocked me to see a potential fight between Hopkins and WBC world champion Adonis Stevenson that it was my opinion that Hopkins had nothing more to prove as a fighter with his legacy and status as a future Hall of Famer in the sport more than secure. When a potential fight with Stevenson did not materialize and Hopkins remaining a fixture at fight cards not only as a promoter as part of Oscar De La Hoya’s Golden Boy Promotions, but also as a broadcaster for HBO Sports and no fights for Hopkins had been announced, I began to feel that perhaps Hopkins may have decided to call it a career. 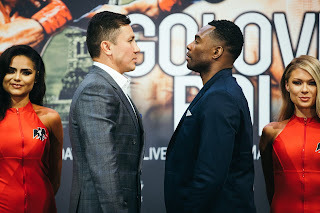 It was not however, a complete surprise to this observer earlier this week to hear that Hopkins, now fifty-one years old would be returning to the ring on December 17th against top Light-Heavyweight contender Joe Smith Jr. at The Forum in Inglewood, CA. Although the idea of a boxer making a comeback over the age of fifty may appear to be odd, it is actually not unprecedented. Some may remember the legendary former Heavyweight world champion Larry Holmes, who at the age of fifty-two entered the ring and scored a lopsided ten round unanimous decision over Eric “Butterbean” Esch in July 2002. Even though the fight between Holmes and the fighter affectionately known as “Butterbean” turned out to be a lopsided decision in Holmes’ favor, Holmes did not enter the ring against a fighter that most considered a contender. This will not be the case when Hopkins enters the ring to do battle against Joe Smith Jr., a veteran of twenty-three professional fights, who is ranked in the top five in both the WBC and WBA respective Light-Heavyweight ratings. Smith will also come into the fight off of a breakout performance in scoring a first round knockout over former world title challenger Andrzej Fonfara in June of this year. Although some may question the wisdom of Hopkins for choosing to face a fighter who is ranked so close to top contender status as recognized by two world sanctioning organizations for his first fight back after a two-year absence, one must remember that this is a fighter in Hopkins that has made a career of defying the odds. On one hand it is an obvious risk for the future Hall of Famer to take on a fighter twenty-four years his junior, but on the other hand if Hopkins were to win this fight he could incredibly be in line to challenge for another world championship and attempt to break his own record for a second time of being the oldest fighter in Boxing history to win a world championship, which he set at age forty-six, surpassing George Foreman, who set it at age forty-five with a knockout win over then unified Heavyweight world champion Michael Moorer in November 1994, when Hopkins defeated WBC world champion Jean Pascal in their rematch in 2011 and again at age forty-eight when he won the Light-Heavyweight world championship for a third time by defeating undefeated IBF world champion Tavoris Cloud. Even though it is certainly understandable how one could be concerned for Hopkins’ safety at an advanced age, as yours truly is, especially against a fighter who scored a brutal knockout in his last fight, the bout between Hopkins and Smith certainly sets up at minimum one of the most intriguing fights of the year. Although I look forward to providing more thoughts and analysis as the fight approaches, the storyline is an obvious one. Can the “Ageless” Bernard Hopkins defy the odds one more time?